World Hair Research» Blog Archive » What is Hair? Hair is one of if not the fastest growing tissue of the body, it’s made up of proteins called keratins. Every strand of hair is made up of three layers: The inner layer (medulla) present in thick hairs only; the middle layer (cortex) determines the strength of the hair strand, texture, and color, and the cuticle, which protects the cortex. The cross section illustration below shows more detail. 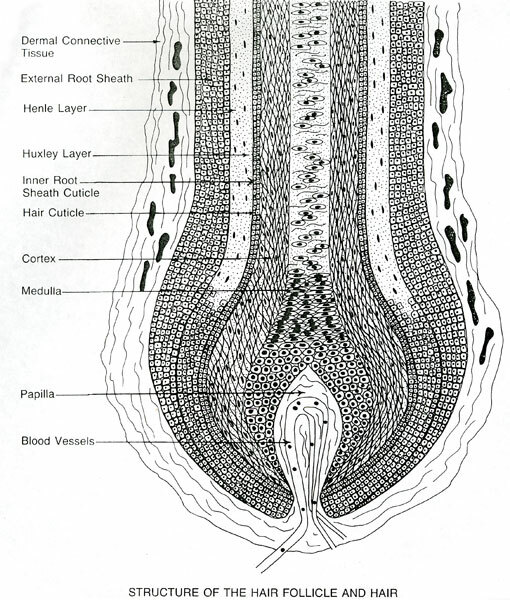 Hair grows from roots, which are enclosed in hair follicles. Below you will see a few illustrations of the hair and skin, the skin is called the dermal papilla (DP), which is fed by the bloodstream carrying nutrients vital to the growth of hair. 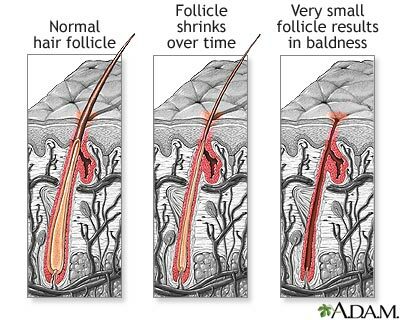 A hair follicle is mostly an epithelial tissue (i.e. it is a part of tissue made of closely-packed cells that are arranged in one or more layers and covers and body surfaces). 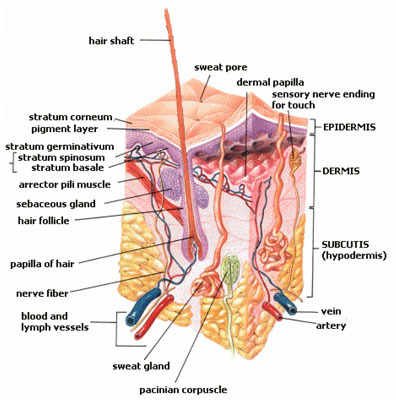 A follicle originates in the dermis. 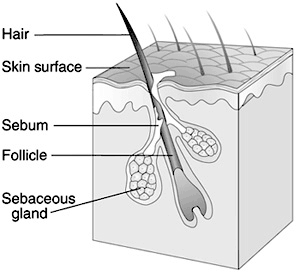 At the base of the hair follicle is what we call the dermal papilla (DP) enclosed within the hair bulb. The DP is crucial to the life-cycle of the hair, it contains nerves and blood vessels that deliver blood and nutrients (providing energy and amino acids) that are used in making keratin, a fibrous scleroprotein found in hair and nails. Only the roots of hair are alive, and get nutrients from the blood stream, the visible part of hair is not living and therefore unable to heal itself. The health of hair is vitally connected to the scalp skin, nutrients, blood circulation and health of the body in general. Solutions in the market claiming to thicken hair or chance the appearance quickly (in one or a few applications) actually work on the visible non-living hair. Patterned hair loss in men and sometimes in women is referred to as Androgenic Alopecia. Hormones have been thought of as the makers or breakers of hair for many years. Hormones called Androgens, such as Testosterone, can cause hair follicles to shrink, causing thinning of hair or eventual hair loss. Reportedly, only bone marrow grows faster in our body than hair does. The average scalp contains 100,000-150,000 hair follicles and hairs, with 90% growing and 10% resting at any given time. Nourishing the hair starts in nourishing your body. A permanent solution to hair loss lies in nutrition, diet, metabolism, hormones, not in topicals. Topically applied herbs and oils can help but they often help by decreasing inflammation locally on the scalp or by killing off scalp parasites. Got The Sugar Blues? Duffy Has Good News! This entry was posted on Wednesday, December 29th, 2010 at 6:46 pm and is filed under ABC's. You can follow any responses to this entry through the RSS 2.0 feed. You can leave a response, or trackback from your own site.